These images show 72ppi (100% on a computer screen) sections of images of a resolution chart, captured using the 50mm focal length at f/3.2. We show the section of the resolution chart where the camera starts to fail to reproduce the lines separately. The higher the number visible in these images, the better the camera’s detail resolution at the specified sensitivity setting. The previous RX100 scored an impressive 28/30 on noise, resolution and sensitivity, and overall image quality was much better than the competition. This was due to its large 1in (13.2×8.8mm) sensor, which was considerably bigger than the 1/1.7in (7.6×5.7mm) sensors found in the Canon PowerShot S110 and the Panasonic Lumix DMC-LX7. For the RX100 II, Sony has back-illuminated the sensor to allow more light to reach the photodiodes. This means the sensor can gather around 40% more light and is capable of a whole extra stop of noise suppression in comparison to its predeccesor. Due to this suppression of noise, the RX100 II now has an expanded sensitivity range of ISO 160-12,800, or up to ISO 25,600 when using the multi-frame noise reduction mode. At the lowest sensitivity setting of ISO 160, slight luminance noise is present in areas of low detail in both JPEGs and raw files. 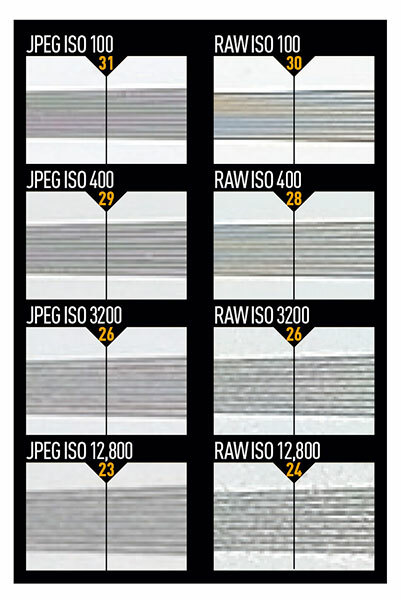 At ISO 2000, there is no colour noise but luminance noise starts to become noticeable. The JPEG images do appear slightly smudgy at upwards of ISO 2000 but this doesn’t become an issue until ISO 3200.